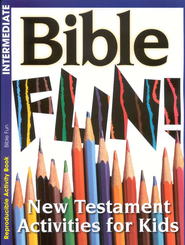 Filled with word searches, mazes, secret codes and more, Bible Fun! New Testament Activities for Kids helps kids learn about the Bible and have fun at the same time! They'll be challenged as they figure out the puzzles. This book is perfect for home or classroom use. It measures 8 1/2" by 11" and has 16 pages. Recommended for ages 7 to 12.